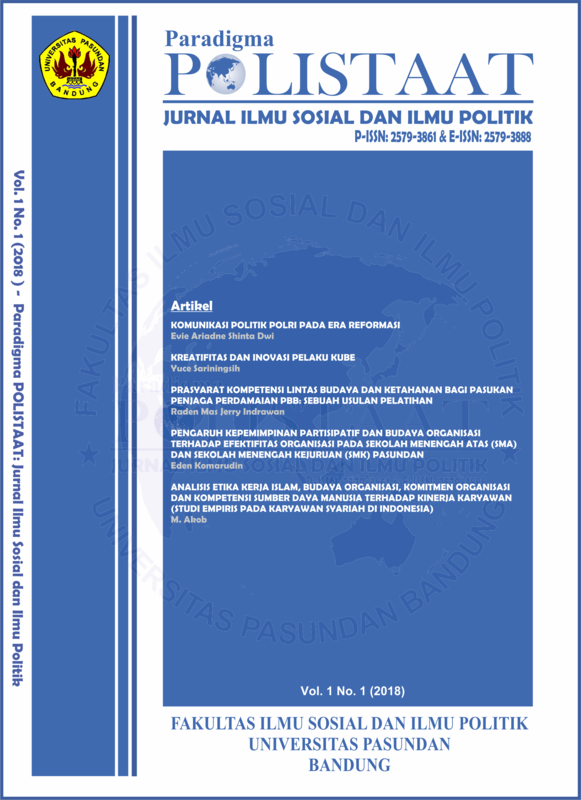 The topic of this article attempts to examine the Indonesian National Police from the perspective of Political Communication with the proposition that although the police are a law enforcement agency, its performance -through communications activities- can have sociological and political influence both locally, nationally and even regional and global. Moreover, if it refers to Peter Berger & Thomas Luckmann's idea where reality is built socially, then the performance of the Police is in line with its core tasks because it creates public order and safeguards is not articulated in a vacuum circumstances, but in the midst of an active society and dynamic. It is what the meant as sociological and political aspects. It’s a Qualitative descriptive study with desk research type which data collected using various sources in the form of documentation studies both hard copy and soft copy obtained in the library or online media. The analysis is done by using political communication concepts. The results of the study show that: firstly, the police institution in the context of social politics has the role of democracy guardian, secondly, police institutions are required to build harmonious political communications with other state institutions, especially with the House of Representatives (DPR) and the Corruption Eradication Commission (Komisi Pemberantasan Korupsi) KPK), and the third is police institutions are required to maintain the positive image of the institution by improving and improving the quality of Human Resources (HR) and enforcement of the integrity of the apparatus. SHINTA DEWI, Evie Ariadne. KOMUNIKASI POLITIK POLRI PADA ERA REFORMASI. Paradigma POLISTAAT: Jurnal Ilmu Sosial dan Ilmu Politik, [S.l. ], v. 1, n. 1, p. 1-17, june 2018. ISSN 2579-3888. Available at: <http://journal.unpas.ac.id/index.php/paradigmapolistaat/article/view/405>. Date accessed: 25 apr. 2019. doi: http://dx.doi.org/10.23969/paradigmapolistaat.v1i1.405.